* Senior club appearances and goals counted for the domestic league only and correct as of 04:06, 13 March 2016 (UTC). Alessio Cerci (Italian pronunciation: [aˈlɛssjo ˈtʃɛrtʃi]; born 23 July 1987) is an Italian professional footballer who plays as a winger for Spanish club Atlético Madrid. Cerci started his professional football career at Roma, playing four times for the first team before serving periods on loan at Brescia, Pisa and Atalanta. He returned to Roma in 2009, where he sporadically played under Claudio Ranieri and was sold to Fiorentina in August 2010. After two seasons in Florence, he transferred to Torino in June 2012. In September 2014, he was sold to Atlético Madrid, before returning to Italy to play for Milan and Genoa. Internationally, Cerci has represented Italy from under-16 to under-21 youth levels. He made his senior international debut in March 2013 a friendly match against Brazil and was included in their squads for that year's Confederations Cup and the following year's World Cup, winning a bronze medal in the former competition. 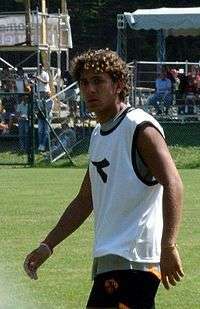 Cerci grew up playing football in Valmontone before joining the Roma youth system. At this time, he was nicknamed "l'Henry di Valmontone" ("the Thierry Henry of Valmontone") due to his playing style. On 16 May 2004, he made his debut in Serie A at the age of 16 under Fabio Capello in the 76th minute against Sampdoria, ending 0–0. The following season, he was a key player in the Roma under-19 side that won the Campionato Primavera 2004–05. With the first team, he made an additional two appearances, playing the final minutes against Internazionale and Cagliari. On 21 March 2005, Cerci signed his first professional contract with Roma for three years. However, he mostly continued to play with the youth team (winning the second edition of the Wojtyła Cup) and making just one appearance for the first team against Chievo on 30 April 2006. On 18 August 2006, Cerci was loaned to Brescia in Serie B. He made his debut in the cadets on 15 September in a 1–1 draw against Bari. He played 21 times for Brescia (mostly as a substitute), helping the Swallows finish the season in sixth place. Cerci returned to Roma at the end of the season, before being loaned to Pisa in 2007. Pisa was then a newly promoted side in Serie B and coached by Giampiero Ventura, who quickly made Cerci a starter in his formation against Bari and Frosinone. On 9 September 2007, Cerci scored his first official goal, in a 1–2 victory away to Cesena. On 25 September, he scored again against Triestina before repeating himself against Treviso, Ascoli and AlbinoLeffe. On 30 October 2007, he scored the first brace of his career during a 3–3 draw to Modena, scoring another two against Cesena on 9 February 2008. On 12 February, however, he suffered a knee injury against his former club Brescia that sidelined him for two months. He returned on 12 April, but after just seven days back, was stretched off the field after a bad fall. Magnetic resonance imaging highlighted that Cerci had broken his meniscus and had inflammation to his anterior crucial ligament. On 26 April 2008, he was operated on in Rome by the same doctor that had operated on Francesco Totti just days before, sidelining him for four months. His first season was ended prematurely with ten goals in 26 appearances, along with seven assists. Returning to Roma, Cerci was prepared to stay in the capital to play in Serie A, but on 25 July 2008, was loaned out to Atalanta for €250,000 with the right to purchase the player in co-ownership for €2.75 million. Cerci once again selected the number 11 shirt, making his debut for the Nerazzurri against Chievo. However, numerous injuries throughout the season limited him just to 11 appearances with no goals scored. Cerci returned to play for Roma in the 2009–10 season, scoring his first official goal for the club on 27 August 2009, a 4–0 victory against Košice in the UEFA Europa League playoffs (7–1 on aggregate). In the league, Cerci played the first four matches against Genoa, Juventus, Catania and Napoli, but Claudio Ranieri would later bench him and mostly play him in the Europa League. On 16 December 2009, he scored a brace during CSKA Sofia–Roma (0–3), the final match of the group stages. He made a further appearance for the club in the second round against Greek side Panathinaikos, providing an assist in the first round for David Pizarro. Cerci finished the season with a total of 19 appearances for Roma in Europe and Serie A, with three goals. On 26 August 2010, Fiorentina signed Cerci outright from Roma for €4 million to be paid over the next three seasons. Cerci made his debut for Fiorentina in the 29 August 2010 match against Napoli, ending 1–1, and scored his first goal in Serie A on 7 November 2010 against Chievo (1–0). Near the end of the season, Cerci scored six goals in five games, with two braces. He concluded the season with 26 appearances and seven goals in the league, plus one goal in Coppa Italia against Reggina. However, Cerci had a difficult rapport with Fiorentina and its supporters. During his time at Florence, he was accused of overindulging in the city nightlife and was famous for illegally parking his Maserati around the city centre. On one occasion, he was fined for refusing to move his car after he parked it in a space reserved for police. In the summer of 2011, Cerci became the focus of a transfer to Manchester City under the direct request of its manager, Roberto Mancini. Just as the deal seemed imminent, however, Cerci decided to stay in Florence, having resolved his issue with the fans. In the 2011–12 season, Cerci scored his first goal during Coppa Italia against Cittadella (2–1), and the first of two goals against Bologna (2–0) in the opening round of the league. He repeated himself against Parma, Lazio and Lecce, but erratic performances and a difficult relationship with the fans called into question his permanence in Florence. On 23 August 2012, Cerci was sold to Torino under a co-ownership agreement for €2.5 million. At Turin, he was reunited with Giampiero Ventura, who had already coached him at Pisa. He made his debut for Torino on 1 September 2012 against Pescara, and 30 September 2012 was a key player against Atalanta, with three assists created. He scored his first goal for the Granata on 25 November, producing the first goal in a 2–2 draw against Fiorentina. On 13 January 2013, he scored his second goal of the season in a 3–2 home victory to Siena. He repeated himself in the next round, scoring the 2–0 away against Pescara. He scored his fourth goal for Torino on 17 February, a match won 2–1 against Atalanta. He concluded his first season at Torino with eight goals and eight assists, also scoring in the final two matches of the 2012–13 season against Chievo and Catania. On 20 June 2013, the co-ownership agreement between Torino and Fiorentina was resolved in favour of Torino for €3.8 million, confirming him for the next season, and taking Marko Bakić permanently to Fiorentina. For the 2013–14 season, Giampiero Ventura began fielding Cerci as a second striker rather than a right winger, a role in which he began to score with greater continuity. He scored his first goal of the season in the opening round against Sassuolo, won 2–0. He scored again in September against Bologna and Milan, before scoring his first brace for Torino against Hellas Verona on 25 September. He scored again on 6 October in a 2–2 draw away to Sampdoria, also providing two assists and a goal against Livorno on 30 October. On 3 November, Cerci ended Roma's record ten-match winning streak, scoring the 1–1 at home for Torino. On 22 December, Cerci ended his mini goal drought, scoring the 4–1 against Chievo, also providing two assists. 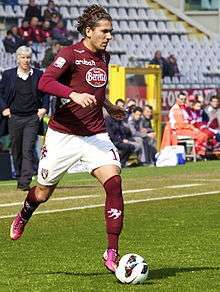 On 26 January 2014, he scored a decisive penalty against Atalanta to give Torino the win 1–0, and on 17 February, scored the second Torino goal in a 3–1 win away to Hellas Verona, breaking his personal record for goals scored during his season at Pisa. With teammate Ciro Immobile suspended, Cerci was the difference in a 2–1 against Cagliari, assisting the first goal and scoring the second on 30 March. On 13 April, Immobile and Cerci scored in stoppage time, Cerci with the last kick of the match, to secure a 2–1 win against Genoa. He ended his season with 13 goals and also 11 assists, the most in Serie A. On 1 September 2014, Cerci signed a three-year deal with La Liga title holders Atlético Madrid for a transfer fee believed to be around €16 million. He debuted for the club 19 days later, replacing Raúl Jiménez for the final eight minutes of a 2–2 home draw against Celta de Vigo. Alessio Cerci scored his first goal for the club in a 5-0 win over Malmö FC in the Champions league. On 4 October, after coming on as a second-half substitute in a 3–1 defeat at Valencia, he was sent off for handball. On 5 January 2015, Cerci returned to Serie A to join Milan on a 18-month-long loan deal. On the same day the loan was agreed, Fernando Torres went the opposite way to Atlético in exchange. Cerci made his debut the next day in a 2–1 defeat at the hands of Sassuolo. He scored his first goal as a Milan player on 4 April 2015 in a 2–1 away win against Palermo. On 22 January 2016, Cerci was loaned to Genoa. He played in all the Italian national youth teams, from Italy U-16 to Italy U-21. After his positive start to the season at Pisa, Cerci was called up to the Italy under-21 by coach Pierluigi Casiraghi. He debuted 16 November 2007 in against Azerbaijan (5–0), scoring the 3–0 goal on an assist from Sebastian Giovinco. Due to injury, Cerci was not called up to the National Olympic side for the Beijing Olympic Games in 2008. From 2007 to 2009, he was part of the Italy U-21 biennium, with whom he took part in the 2009 UEFA European Under-21 Football Championship in Sweden, but never played. On 17 March 2013, Cerci was called up for the first time to the Italian senior team by Cesare Prandelli for a friendly against Brazil and a 2014 FIFA World Cup qualification match against Malta. He made his debut on 21 March, replacing Andrea Pirlo in the 46th minute in a 2–2 draw with Brazil. On 16 May 2013, he was included in the list of 31 provisional players ahead of the 2013 FIFA Confederations Cup in Brazil, with his place confirmed in the final list submitted on 3 June. On 11 April 2014, he was included in the list of 30 provisional players by Cesare Prandelli for the 2014 World Cup, with his place confirmed on 1 June. Cerci is a naturally left footed player, with excellent technique, vision and remarkable quickness, playing mainly as a winger or as an attacking midfielder on the flank. He can play on both wings, but prefers the right, from which he can cut inside and shoot or provide crosses and assists with his stronger foot. His playing style has drawn comparisons to Arjen Robben. During the 2013–14 Serie A season with Torino, he began to be used regularly in a creative, supporting role as a second striker, alongside the more offensive centre-forward Ciro Immobile. ↑ "Prima Squadra Serie A Tim 2013–2014 Alessio Cerci". torinofc.it. Torino Football Club. Retrieved 23 March 2013. ↑ "Torino and Italy given reason to smile by second coming of Alessio Cerci". theguardian.com. The Guardian. Retrieved 19 March 2014. 1 2 "Alessio Cerci and Mattia De Sciglio given debut call-ups for Italy". sbnation.com. Retrieved 19 March 2014. ↑ "The Henry of Valmontone". blogistuta. Retrieved 19 March 2014. 1 2 "Bandini: Hot-and-cold Alessio Cerci gets his shot with Prandelli's Italy". thescore. Retrieved 18 March 2014. ↑ "Roma: Cerci firma fino al 2008". tuttomercatoweb.com. Retrieved 19 March 2014. ↑ "CHIEVO VERONA VS. ROMA 4 – 4". soccerway.com. Retrieved 19 March 2014. ↑ "Pisa vs Triestina 2–1". goal.com. Retrieved 19 March 2014. ↑ "Fiorentina, ufficiale acquisto Cerci dalla Roma". tuttosport.com (in Italian). Florence. 26 August 2010. Retrieved 18 March 2014. ↑ "Cerci alla Fiorentina: la Roma incassa 4 milioni di euro". asromalive.com (in Italian). 26 August 2010. Retrieved 18 March 2014. ↑ "Half-yearly financial report for the six months ended 31 December 2012 approved" (PDF). AS Roma. 28 February 2011. Retrieved 13 May 2011. ↑ "FIORENTINA VS. NAPOLI 1 – 1". soccerway.com. Retrieved 18 March 2014. ↑ "FIORENTINA VS. CHIEVO 1 – 0". soccerway.com. Retrieved 18 March 2014. ↑ "Goleador viola: Cerci leader del girone di ritorno". www.violanews.com (in Italian). Retrieved 18 March 2014. ↑ "Fiorentina 3–0 Reggina: Viola Cruise Past 10-Man Visitors To Advance In Coppa Italia". goal.com. Retrieved 18 March 2014. 1 2 "Cerci finally lives up to hype". uk.eurosport.yahoo.com. yahoo. Retrieved 18 March 2014. ↑ "Fiorentina, Cerci multato da Polizia". ansa.it. Retrieved 18 March 2014. ↑ "CALCIO, FIORENTINA: CERCI PARCHEGGIA IN POSTI POLIZIA, MULTATO". repubblica.it. Retrieved 18 March 2014. ↑ "Manchester City: Mancini vuole prima del 13 sia Nasri che Cerci". tuttomercatoweb.com. Retrieved 18 March 2014. ↑ "City target Cerci wants Fiorentina stay after 'making peace' with club's fans". dailymail.co.uk. Retrieved 18 March 2014. ↑ "Bologna, brutto esordio la Fiorentina vince 2–0". repubblica.it. Retrieved 18 March 2014. ↑ "Torino sign Cerci on co-ownership deal". foxsportsasia.com. Retrieved 16 April 2014. ↑ "Tactical Analysis: How has Alessio Cerci risen to prominence with Torino?". thinkfootball.co.uk. Retrieved 16 April 2014. ↑ "Torino vs. Pescara 3–0". soccerway.com. Retrieved 16 April 2014. ↑ "Atalanta vs. Torino 1–5". soccerway.com. Retrieved 16 April 2014. ↑ "Torino vs. Fiorentina 2–2". soccerway.com. Retrieved 16 April 2014. ↑ "TORINO VS. SIENA 3–2". soccerway.com. Retrieved 16 April 2014. ↑ "Pscara vs. Torino 0–2". soccerway.com. Retrieved 16 April 2014. ↑ "Torino vs. Atalanta 2–1". soccerway.com. Retrieved 16 April 2014. ↑ "Chievo Verona vs. Torino 1–1". soccerway.com. Retrieved 16 April 2014. ↑ "Torino vs. Catania 2–2". soccerway.com. Retrieved 16 April 2014. ↑ "Co-ownerships: Cerci to Torino, Bakic to Fiorentina". violachannel.tv. Retrieved 16 April 2014. ↑ "Alessio Cerci and Ciro Immobile firing Torino towards Europe". sbnation.com. Retrieved 16 April 2014. ↑ "Cerci: I can play anywhere". football-italia.net. Retrieved 16 April 2014. ↑ "Torino vs. Sassuolo 2–0". soccerway.com. Retrieved 14 March 2014. ↑ "Bologna vs. Torino 1–2". soccerway.com. Retrieved 16 April 2014. ↑ "Torino vs. Milan 2–2". soccerway.com. Retrieved 16 April 2014. ↑ "Torino vs. Hellas Verona 2–2". soccerway.com. Retrieved 16 April 2014. ↑ "Sampdoria vs. Torino 2–2". soccerway.com. Retrieved 16 April 2014. ↑ "Livorno vs Torino 3–3". soccerway.com. Retrieved 16 April 2014. ↑ "Roma's 10-game win streak ends with Torino draw". sportsillustrated.cnn.com. Sports Illustrated. Retrieved 16 April 2014. ↑ "Torino vs. Roma 1–1". soccerway.com. Retrieved 16 April 2014. ↑ "Torino 4–1 Chievo". torinofcinglese.com. Retrieved 16 April 2014. ↑ "Torino vs. Chievo Verona 4–1". soccerway.com. Retrieved 16 April 2014. ↑ "Torino vs. Atalanta 1–0". soccerway.com. Retrieved 16 April 2014. ↑ "Hellas Verona vs. Torino 1–3". soccerway.com. Retrieved 16 April 2014. ↑ "Torino 2–1 Cagliari: Cerci The Difference In Granata Victory". forzaitalianfootball.com. Forza Italia Football. Retrieved 16 April 2014. ↑ "Torino 2–1 Genoa". Football Italia. 13 April 2014. Retrieved 30 August 2014. ↑ "Cerci uomo-assist del 2013–14, batte tutti i record". corrieredellosport.it (in Italian). Retrieved 20 May 2014. ↑ "Acuerdo con el Torino FC para el traspaso de Alessio Cerci" [Agreement with Torino FC for the transfer of Alessio Cerci] (in Spanish). Atlético Madrid's official website. 1 September 2014. Retrieved 1 September 2014. ↑ "Atl Madrid 2–2 Celta de Vigo". BBC Sport. 20 September 2014. Retrieved 4 October 2014. ↑ "Valencia 3–1 Atletico Madrid: Simeone's champions stunned at the Mestalla". Goal.com. 4 October 2014. Retrieved 4 October 2014. ↑ Gladwell, Ben (5 January 2015). "Alessio Cerci completes 18-month loan deal to Milan from Atletico Madrid". ESPNFC. Retrieved 7 January 2015. ↑ "AC Milan sign Chelsea's Fernando Torres on permanent deal". BBC Sport. 27 December 2014. Archived from the original on 28 December 2014. ↑ "AC Milan vs Sassuolo". Soccerway. Retrieved 6 January 2015. ↑ "Official: Genoa sign Cerci". Football Italia. 22 January 2016. Retrieved 23 January 2016. ↑ "DUE GIORNI DI RADUNO A COVERCIANO: TRA I CONVOCATI AGAZZI, BONAVENTURA E SAU". figc.it (in Italian). Federazione Italiana Giuoco Calcio. Retrieved 16 April 2014. ↑ "INVIATA ALLA FIFA LA LISTA PER LA CONFEDERATIONS CUP: C'È ANCHE BARZAGLI". figc.it (in Italian). Federazione Italiana Giuoco Calcio. Retrieved 16 April 2014. ↑ "ECCO I 30 PRE-CONVOCATI PER IL MONDIALE. IL 19 MAGGIO IL RADUNO". figc.it (in Italian). Federazione Italiana Giuoco Calcio. Retrieved 14 May 2014. ↑ "PRANDELLI HA SCELTO: ECCO I 23 AZZURRI CHE PARTIRANNO PER IL BRASILE". figc.it (in Italian). Federazione Italiana Giuoco Calcio. Retrieved 1 June 2014. ↑ "Sentite Ventura: "Cerci come Robben e Ribery"". violanews.com (in Italian). Retrieved 20 March 2014. ↑ Rathborn, Jack. "Alessio Cerci: Why Italy's Late Starter Could Be a Big Star at World Cup 2014". bleacherreport.com (in Italian). Bleacher Report. Retrieved 20 March 2014. ↑ "Cerci, un futuro da seconda punta?" (in Italian). Toro.it. Retrieved 15 January 2015. ↑ Alessio Cerci profile at Soccerway. Retrieved 8 December 2015. ↑ "Happy birthday to Alessio Cerci, who turns 27 today!". Vivo Azzurro.it. 23 July 2014. Retrieved 21 December 2015. ↑ "Uruguay 2–2 Italy". BBC Sport.com. 30 June 2013. Retrieved 21 December 2015. Wikimedia Commons has media related to Alessio Cerci.